On long maturities equity options, the smile is usually very much like a skew: very little curvature. This usually means that the SVI rho will be very close to -1, in a similar fashion as what can happen for the the correlation parameter of a real stochastic volatility model (Heston, SABR). In terms of initial guess, we looked at the more usual use cases and showed that matching a parabola at the minimum variance point often leads to a decent initial guess if one has an ok estimate of the wings. We will see here that we can do also something a bit better than just a flat slice at-the-money in the case where rho is close to -1. In general when the asymptotes lead to rho < -1, it means that we can't compute b from the asymptotes as there is in reality only one usable asymptote, the other one having a slope of 0 (rho=-1). The right way is to just recompute b by matching the ATM slope (which can be estimated by fitting a parabola at the money). 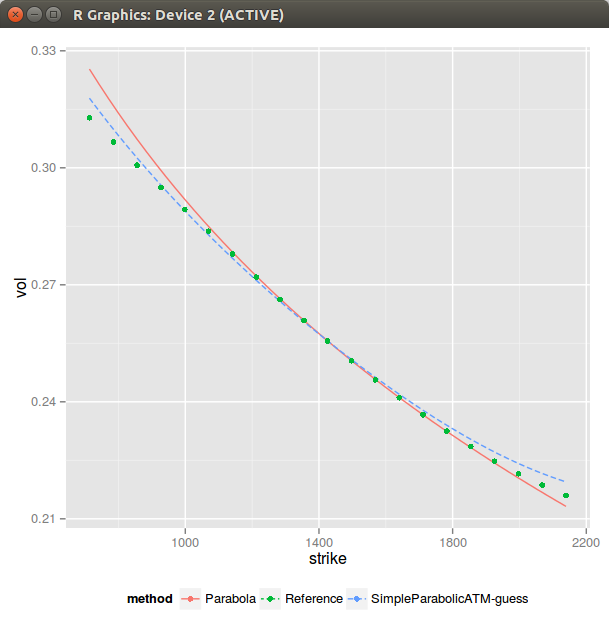 Then we can try to match the ATM curvature, there are two possibilities to simplify the problem: s >> m or m >> s.
when m = 0, the at-the-money slope is just b*rho. 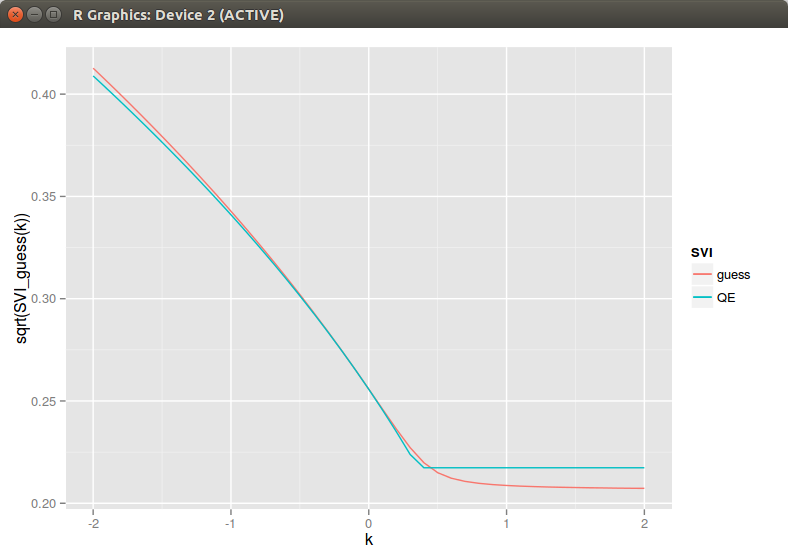 when m != 0 and m >> s, the at-the-money slope is b*(rho-1). Of course a simple fix is to not let s to be too small, but how do we defined what is too small? I have found that a simple rule is too always ensure that s is increasing with the maturity supposing that we have to fit a surface. This rule has also a very nice side effect that spurious arbitrages will tend to disappear as well. On the figure above, I can bet that there is a big arbitrage at k=m for the QE result.